Especially when an SAP user calls a transaction in change mode, sometimes a message indicating that the record is currently being processed is displayed. This message clearly gives the hint of a locking situation in the SAP system. Another user can be working on the same data and preventing others to access to the same data in edit mode (change mode). In such cases, SAP users can call SM12 Select Lock Entries tcode for displaying the list locks filtered by given parameters. This ABAP tutorial will show how to use SM12 briefly. Call ABAP transaction SM12 "Select Lock Entries" SAP transaction. When SAP screen is displayed, provide data that will help you to filter among all locks in the system. 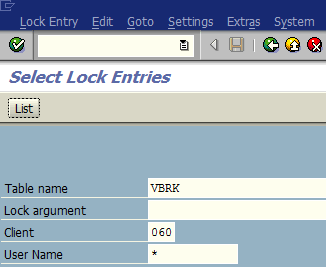 For example, you can enter VBRK in table name filter field for billing document related locks in the SAP system. Or for sales documents VBAK table can be used. Press List button of F8 to execute the ABAP report which will display a list of locks existing on the selected SAP system client. The user name column will give the user information who is causing the lock of who is keeping the data in change mode preventing others to change the data.